Compared to chicken, mutton and ‘country chicken’ were sold like hot cakes. Cashing in on the demand, several traders have hiked the prices. 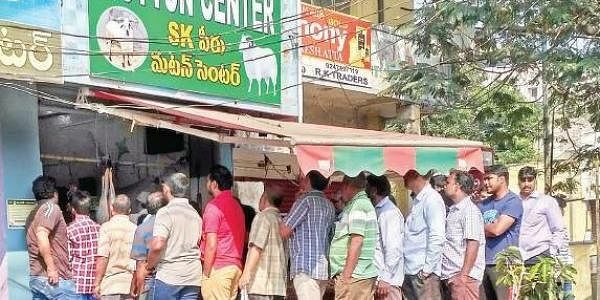 VISAKHAPATNAM: Meat shops did a brisk business on Sunday on account of ‘Kanuma’, the final day of the three-day Sankranti festival here. Compared to chicken, mutton and ‘country chicken’ were sold like hot cakes. Cashing in on the demand, several traders have hiked the prices. All the meat shops in the city witnessed heavy rush since early morning. Especially the abattoir at Hanumanthuwaka Junction was seen packed with people waiting to buy the meat. Though broiler chicken price has remained stable at Rs 140/kg, the price of mutton has zoomed to Rs 550 to 600. Some traders claimed that the supply was low. “Children would like to have chicken, but elders love mutton. That’s why we bought both two kg each of chicken and mutton. We generally consume meat on Kanuma and it’s good to have it on Sunday,” said S Aruna, a homemaker from Ramalayam street. The demand for country chicken was also high. The price of good quality country chicken has touched Rs 540 a kg from Rs 430.